On the Saturday morning a small but keen group (followed by late-comers) gathered at Coledale Beach: Arunas Pilka, Gary Edmond, Dave Malcolm, Gary Parker, Patrick Carmody, Michael Maleedy, Peter Adams, Dirk Stuber, Jackie Windh, Mark Pearson (aka Fishkiller). We had a range of short (whitewater) boats: two Wildcats provided by John Slattery of Canoe World, Gary’s MI335, Dave’s Alpha, Dirk’s Magic Bat; as well as an assortment of sea kayaks. 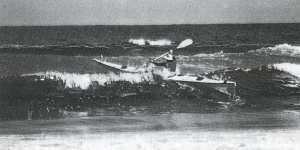 From the point of view of playing in the surf, the short boats were vastly more suitable – and, because they were plastic, we did not have to worry about damaging them! After a short discussion, it was agreed that since none of the group members were beginners, we would go down to Sharky’s Beach and have a play there. Sharky’s is a beach break, with a rocky reef at the north end, which should be avoided (see below). Sunday we played on the point break at Sandon Point, which is known for its long ride favoured by wave-ski riders. Here the acrobatics continued, and some of us ventured into the reef to the south. Dirk reckons the surf was two metres – Jackie reckons it was more like five. People paddled as they felt like it, according to their own skill level (or sometimes a bit beyond). Boats were swapped, ideas were shared, encouragement was given. Most people had life-jackets and helmets (Arunas distinguished himself by paddling naked), and the safety rule of one boat per wave was mostly observed. Mike getting creamed by a paddler surfing backwards (initials DS), and avoiding injury by executing a beautiful capsize-and-roll. Patrick getting blasted by a wave inside the reef at Bulli Point and coming out of his Puffin amongst the rocks, without injury to himself or his boat. Dirk burying the banana, as promised in the promo material distributed by Gary. Dirk entrusting his Arctic Raider to Gary’s care, then returning to the group to hear with horror the acrobatic manouevres that his boat had executed in his absence. Fishkiller choosing to land through all of the rocks at the north end of Sharky’s at low tide – and being carried gently over them by a luckily timed swell. Dirk doing two backflips in his Arctic Raider at Sandon Point, and coming out of the boat at the beginning of a BIG set – again with no injury to boat or pilot – and as usual, rescued by the able and fearless Gary Edmond. Arunas celebrating his 40th on the Saturday night at Coledale with a chocolate cake decorated with an icing figure of Arunas kayaking amongst the rocks. (Arunas at age 40 was noticeably less agressive in the waves than he had been on Saturday, when he was only 39). To all the beginners and surf-neophytes who didn’t show up – you missed some expert instruction, as well as some good demos of both do’s and don’ts. Hope to see you next year! This entry was posted in Magazine by smeyn. Bookmark the permalink. I am a software engineer with a generalist bent. My past work has been in requirements, methods, architecture, testing and general project work.